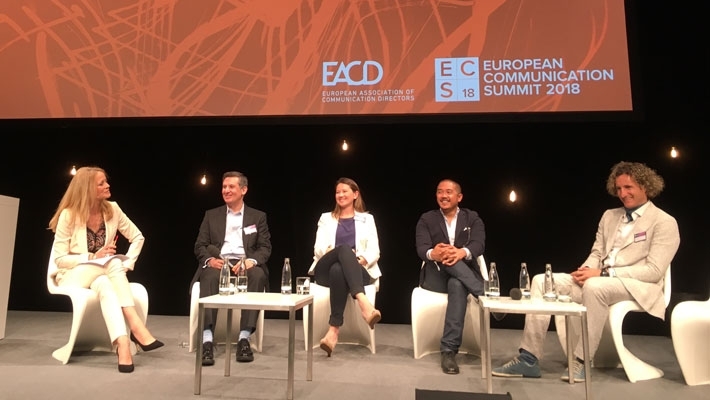 With the assistance of more than 400 professionals from all over Europe related to Corporate Communication, the “European Communication Summit” was held in Berlin, organized by the EACD, in which IPRN was present through our President, Luis González. Topics such as fake news, post-truth, artificial intelligence, trust, multilinguality, empathy, the construction of reputation or the evolution of the role of the CCO have been discussed. Focused on a subject such as post-truth, it was commented that false news moves through networks because it is cheap and there is no control, but there is a clear tendency of people who are willing to pay for having truthful sources.In this respect, the New York Times is clear that “if you want to have good and true news you have to pay for them.Journalism is still a very necessary profession but the problem is that the struggle to be the first to inform makes contrasting the truth more and more difficult. It was also commented that in many countries where television news is not credible, social networks are seen as the best alternative to see things from another point of view.